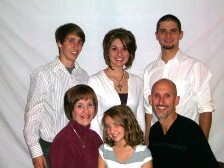 My wife, Sharon, and I have been married since 1983 and are blessed with four wonderful children. Since my salvation at age 18, I have had a passion for ministry. That passion has been shaped by God into a desire to strengthen and support marriages and families. To that end, I received a degree in counseling and Bible from William Tyndale College, in Michigan, and then completed an M.A. in Marriage and Family Therapy. My hope and prayer is to use any talents or gifts I may have to help prepare couples for a strong marriage, strengthen those that may be struggling, and build positive parenting skills to help children grow up in a loving and caring Christian home. I believe that marriage is an incredible gift from God designed to reflect His glory in unique ways. When a husband and wife are in right relationship with Jesus and filled with His Spirit, there should be a growing unity, and sacrificial serving of one another. Perhaps even the world will take notice and praise the Father. As children grow up in this environment, experiencing the love and care of authentic Christians, they will have the best opportunity to fall in love with the Savior for themselves. I also believe that marriages are under attack from the enemy of God because of this reflection and influence. Add to that battle the sinful flesh and a world system under the sway of the enemy and you have potential chaos and dysfunction at every turn. Given this scenario, I seek to first give myself as fully as possible to God, desiring to walk in His ways by His power. I believe that God cares for every person, marriage, and family, and desires for us to experience the greatest joy and richest relationship as we grow and mature in Him. I desire to minister in such a way as to help people reconcile with God through faith in Christ; and to grow in their relationship with Him and one another as they yield to the Spirit of God and His transforming work. Personally, I am humbled to be used by God at all, but when the opportunity is present to minister, I follow the direction in I Thessalonians 5:14 to “help,” “warn,” “encourage,” and be “patient.” Whether shepherding my own family, or my church family, my goal is to prayerfully, diligently, and honorably care for the people that God has entrusted to me.